Macon Candy: See You on the Sweet Side: Ooh-la-L.A.
Once again, family knows just what a girl likes. Today, Mom received a special Fed-Ex by way of L.A. from her sister Georgie Girl that put a big smile on her face. 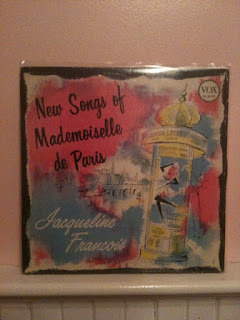 A vintage Vox vinyl of "New Songs of Mademoiselle de Paris" Jacqueline Francois (circa 1952) will soon be spinning on her record player. And the contents of the brown paper bag from L.A.'s famed Trashy Lingerie . . . well, Shuga D sends his thanks. There are moments when Mom misses Georgie dearly but receiving such sweet discoveries from her Hollywood stomping grounds continues to make Mom proud that her little sis is working hard on her fairytale. Tonight, Mom is searching for a star in the sky and hopes it's the same one her Los Angeles' angel is wishing upon from the West Coast. Candy Lou loves you (Auntie)!